Kigelia Camp is set amongst a grove of trees set high on the banks of the Ifuguru Sand River in Ruaha National Park. It is a small camp in a vast and beautiful wilderness. Sandy paths lead from the main area to the 6 spacious twin/double tents, all with ensuite bathroom complete with flush toilet and open air, yet discreetly screened, bucket shower. All tents have a private veranda where you can relax and enjoy the views to and across the river in perfect seclusion. 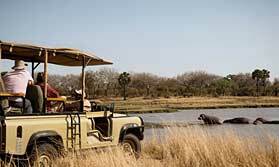 The camp provides daily game drives in open sided vehicles departing in the early morning and again in late afternoon. All day game drives can also be arranged, with picnic lunches, drinks and snacks. Guided walks with national parks rangers are also popular and are a good way to get a feel for the environment as you stand beside a huge baobab tree, watch insects and birds and learn how to 'read' the bush. Back at the camp, delicious meals are served in the thatched dining area or out in the open and by the camp fire after dark. There is plenty of choice of dishes and dinner is a full 3-course affair. A good selection of wines is available to accompany meals. Sundowners are served each evening by the camp fire where you can unwind and chat over the day's events. READ AMANDA'S BLOG: Tribes' director Amanda Marks visited Kigelia Camp in June 2018. You can read her blog about this for a personal view of the camp experience. Open: Kigelia Camp is open all year. Location: Kigelia Camp is on the banks of the Ifuguru Sand River in Ruaha National Park. The camp has a secluded setting in a grove Sausage, also known as Kigelia, trees. The nearest airstrip is at Msembe, 20kms from the camp. The camp is close to the Mwagusi River and Great Ruaha River confluence. Rooms: Accommodation is in 6 spacious tents, with locally-made beds, a lockable trunk for valuables and an en-suite bathroom with flush toilet and open air bucket shower for which hot water is provided on your request. A selection of toiletries is supplied. Each tent has a private veranda at the front. There is a larger family tent with 2 en-suite bathrooms. The maximum capacity of Kigelia is 12 guests. Activities: These centre around game viewing in Ruaha National Park. The camp offers game drives and walking safaris, and you can discuss your preferences with your guide, to design your own programme of events. Game viewing includes bush breakfasts and picnic lunches where appropriate. Visits to local villages where Kigelia is involved in community projects can be arranged, too, and offer a valuable chance to witness local life. This is a good area for photography and bird watching. Facilities: The main area is set beneath thatch and open to the sides, protected from the sun but admitting any breeze, and houses the living and dining areas, which include a reference library. Sundowners are served round the camp fire facing the sand river. There is a choice of wines to accompany meals. Electrical items can be charged in the main area. The camp offers a free laundry service. Dining: Meals are eaten communally. Children: Children aged 6 and over are welcome. If the camp is booked for exclusive use, children of any age are welcome. Communication: There is mobile phone coverage. We know and love Tanzania, and would be delighted to help you plan your perfect trip here. Let us help you plan your perfect tailor-made holiday to Tanzania. Talk to one of our travel experts. Tell us what you want, and we will tailor make your perfect trip. Get right off the beaten track with this safari to some of the most remote, but spectacular locations in Tanzania. Solar lighting, only bucket showers, 'per night' fees donated to the local community for local education & health projects, active members of the Ruaha Conservation Fund......we could go on! This little lodge has its heart in the right place. "You wouldn’t necessarily think that a small open wooden structure with a thatched roof could be a stylish and comfortable place to be in the middle of the bush – it is at Nomad’s Kigelia Ruaha Camp. I loved my 2 night stay here in June 2018. It’s a friendly, well-run bush camp, with an excellent manager (Ken), great camp staff that can’t do enough for you, and my guide Hussein was excellent. Add to that the comfy vehicles and a willingness by the whole team to make your stay here as special as possible, and you can’t help but have a great time in Ruaha if you stay here. Everyone I met here loved the place, and it’s in one of the best wildlife viewing areas of the park." "I stopped here for breakfast and it was the best brekkie I had on the entire trip! The camp is gorgeous and the rooms are all really spacious with en suite bathrooms. The mess tent is more like a proper dining room, and is stylishly furnished. Vehicles are lovely! Very luxurious open sided 4x4. All seats are covered and extra padded for comfort over the bumps!"